Identification: The body of this species is translucent with orange viscera visible through the notum and, usually, an interrupted white stripe down the mid-line. In some animals the white stripe may be continuous (but narrow and with constrictions). The margin of the mantle is white with a magenta submarginal line that becomes diffuse anteriorly and posteriorly. There is often a submarginal magenta line on the dorsal surface of the foot. 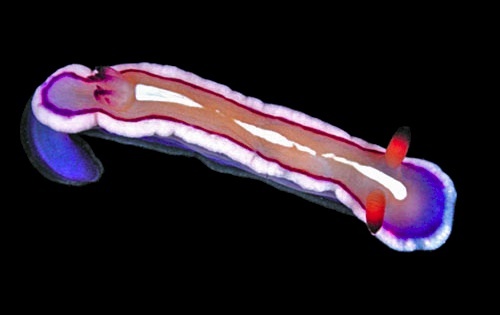 The rhinophores and gills are translucent and usually tipped with magenta. It can be distinguished from Verconia sp. #4 by its magenta-tipped gills, darker-orange notum and narrow/interrupted mid-dorsal stripe. Natural history: Verconia varians is a moderately rare species found in moderately exposed rocky habitats from 3-30 m (10-98 ft). It is one of several chromodorids that vibrate their gills. The egg mass is pale yellow-orange without extracapsular yolk. Taxonomic notes: This species was listed as Thorunna gloriosa (Bergh, 1874) in Bertsch and Johnson, 1981 (bottom photo). It was first recorded in Hawaii at Magic Island, Oahu by Scott Johnson on Nov. 14, 1977. The name means variable. It's listed in many sources as Noumea varians. Photo: PF: Makena, Maui; March, 2000.